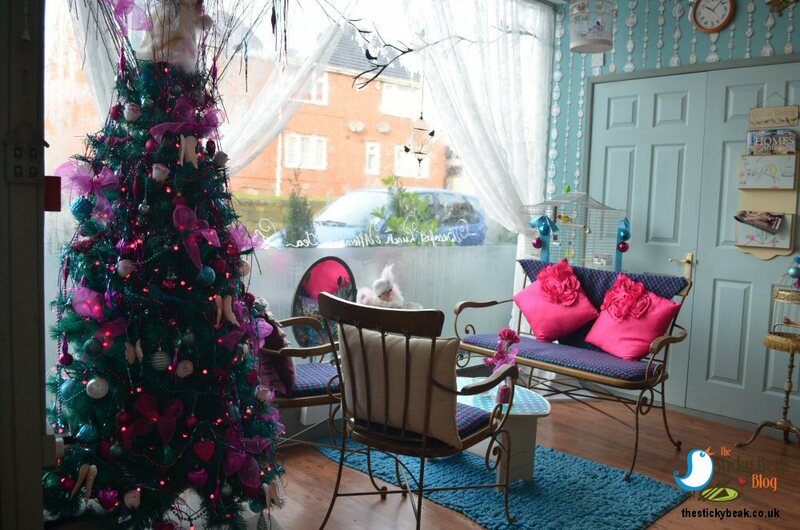 On the 26th November 2016 The Bird Cage Tearoom opened its doors in Leabrooks, so we decided to go down and investigate. Previously, Moja had had their takeaway premises here, but you wouldn’t know it from the transformation owner Richard has done. Be prepared for sensory overload dear reader, in the nicest possible way. Pale blue paper with crystal drape print nestles alongside cerise, bright orange and turquoise stripe paper to create an uplifting, vibrant atmosphere. A multitude of ornamental bird cages hand from the ceilings, ornate mirrors adorn the walls, and resident canary George (pronounced Gay’org after Christopher Plummer’s Sound of Music character, Captain George Von Trapp) chirrups away happily in his window-view house. Conveniently, I chose a table near the glass cabinet that houses a plethora of sparkly treasures such as brooches, ear rings and necklaces so I could coo over them, and drop hints to The Man BirdJ It is waiter service in the Bird Cage, so we perused the menu and waited for the wonderful Richard to come over. I should mention the apparel of Richard and his team; they have the most wonderfully coiffed handlebar moustaches and dress very nattily in drainpipe jeans with turn ups, stripe shirts and wickedly pointed patent leather winkle picker shoes. The effect is very dashing and uber stylish. His Nibs had (surprise surprise) a full English Breakfast, and I opted for the Eggs Benedict on Bloomer bread; we had the Cafetiere of coffee for 4, figuring that a caffeine buzz was needed for the busy day ahead. The food is cooked fresh to order, so there is a small wait, but I would much rather have that and get hot, delicious food than have it pinged in a microwave or have items that were being kept warm in an oven wouldn’t you? Little pots of Brown sauce and Tomato Ketchup were brought over to the table after enquiries were made as to whether we wanted them or not. 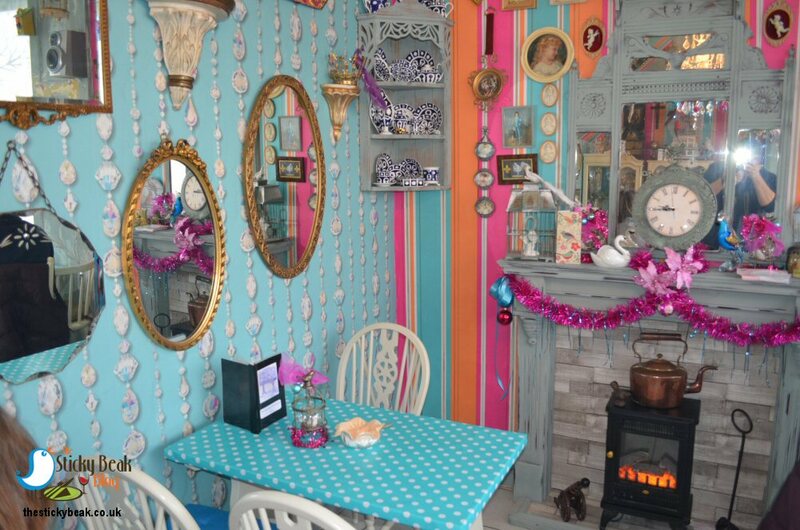 Along with the sugar bowl being kept covered with a crocheted doily, having the condiments brought out as required was just a nice little touch I thought. 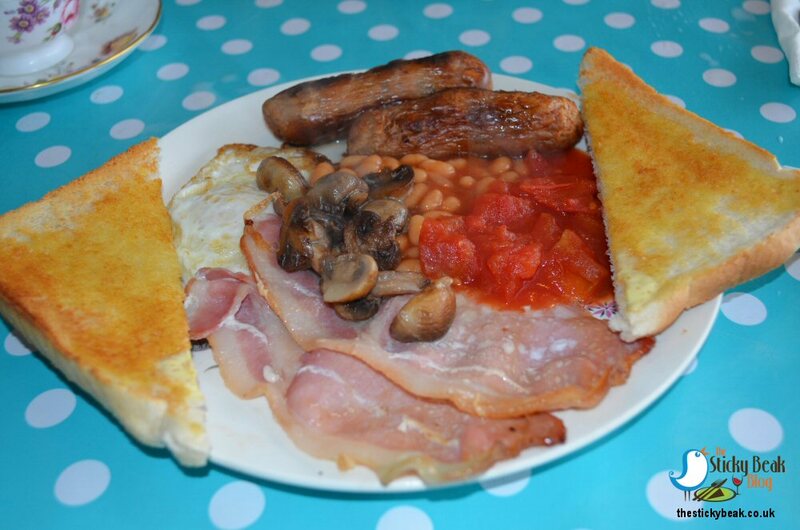 The Full English had all your favourites on there; 2 rashers of Bacon, 2 Sausages, fried Egg, Beans, Tomatoes, Mushrooms and Toast for a very purse friendly £4.95. His Nibs said the Bacon was very good quality; thickly sliced and bang full of flavour, and the Sausage hit the same criteria too. The egg had a great sunshine yolk to it with a rich taste to it, and the button mushrooms had kept their natural texture which the palate appreciated. I always think that chopped Tomatoes go brilliantly with toast, as you can let them soak into the bread for a comforting, squashy mouthful of yumminess. My Eggs Benedict on Bloomer bread were delicious. 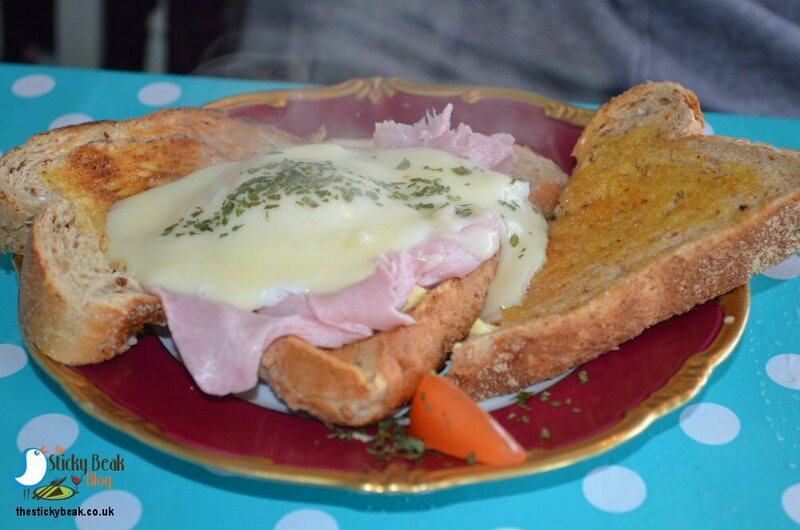 The bread itself was lovely and fresh and was topped with generous slices of cured Ham (not pre-packed slime), gently poached eggs and a wonderful Hollandaise sauce that just had a nice hint of mustardy/vinegar sharpness to it. Every mouthful was superb, from beginning to end; just what you need to start the day. There was a steady stream of people come in to eat, ranging from older couples, workers taking their breaks and families, as well as customers popping in for items to take out and eat. Gay’org was merrily whistling away to his audience brightening up the grey day in his own inimitable style, and several children found him mesmerising. 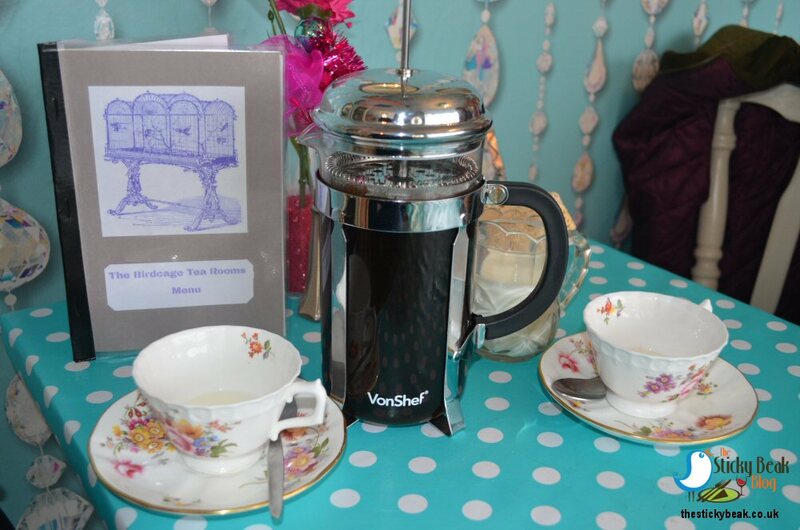 Children are more than welcome at The Bird Cage Tearoom and even have their own lunch menu! Different dishes are served according to the time of day; breakfast is served until 11am when lunchtime takes over with its array of temptations, afternoon tea is served from 2pm and then there is high tea to enjoy if you so wish. Cream teas are also available if you just want the sweeter treats rather than have the savoury selection too. There is a great selection of cakes to indulge in which we didn’t get chance to sample on this occasion, and so another visit will just have to be done (purely in the name of research of course). I have my eye on the Sticky Toffee Flapjack already! Richard and his team are planning a ‘40s theme night in January 2017, serving Bangers and Mash and Bread and Butter pudding with proper evaporated milk. Keep an eye out for further details, we certainly shall be.